Q: Now that my gladiolus have bloomed, can I dig up the bulbs and save them for next year? A: You need to let the gladiolus plant grow so it can produce and save food for its bulb next year. After the leaves turn brown and decline in the fall, the bulbs can be stored and saved for next year. 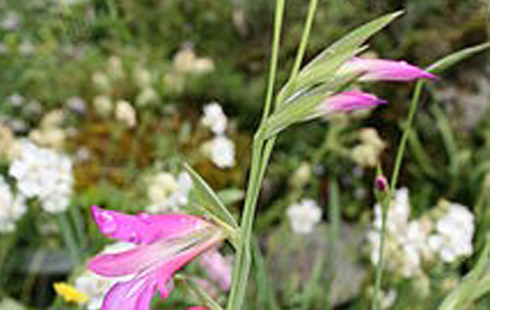 Q: The gladiolus I planted were doing fine but now they look dingy and washed out. I feed them and can not see anything that might be causing this. Do you know what it might be? A: The common thing that causes your description is thrips. These are insects that are almost microscopic. You can apply regular soap spray or use a systemic insecticide to correct the problem. Q: The leaves on my geraniums are yellowing. The plants have been fine all spring and blooming well. Do I need to feed them or what? A: In late summer, the heat will cause decline in geraniums. If they make it through September, they will put on new growth and continue to flower. Feed them every four to six weeks and, weather permitting, they will continue to thrive. Q: I have a basket of geraniums with an eastern exposure. It has a lot of buds on it and I do not think that they will open. It looks like the buds are dying. Am I watering incorrectly or is it something else? A: If the foliage of the plant is healthy it is most likely not a watering problem. The buds may be diseased. Fungus disease can affect buds, flowers, roots. leaves and bark. If the buds do not open and the stem then starts dying back, cut the plant back to remove the diseased portions. Then feed the plant and grow it back out. Q: The leaf tips on my bougainvillea and grapes are turning brown on the tips. What could be causing this? A: Browning at the tips can be caused by several things. It can be heat stress, salt from water or fertilizer or the start of a nutritional problem. I would not be concerned about the grapes since they typically decline in late summer after production.